Last week I was in Orlando attending CTIA. While enjoying the Florida weather, two SSDs arrived at my office back in NC: Intel's SSD 320, which we just reviewed three days ago and Crucial's m4. Many of you noticed that I had snuck in m4 results in our 320 review but I saved any analysis/conclusions about the drive for its own review. There are more drives that I've been testing that are missing their own full reviews. Corsair's Performance Series 3 has been in the lab for weeks now, as has Samsung's SSD 470. I'll be talking about both of those in greater detail in an upcoming article as well. And for those of you asking about my thoughts on the recent OCZ related stuff that has been making the rounds, expect to see all of that addressed in our review of the final Vertex 3. OCZ missed its original March release timeframe for the Vertex 3 in order to fix some last minute bugs with a new firmware revision, so we should be seeing drives hit the market shortly. There's a lot happening in the SSD space right now. All of the high end manufacturers have put forward their next-generation controllers. With all of the cards on the table it's clear that SandForce is the performance winner once again this round. So far nothing has been able to beat the SF-2200, although some came close—particularly if you're still using a 3Gbps SATA controller. All isn't lost for competing drives however. While SandForce may be the unequivocal performance leader, compatibility and reliability are both unknowns. SandForce is still a very small company with limited resources. Although validation has apparently improved tremendously since the SF-1200 last year, it takes a while to develop a proven track record. As a result, some users and corporations feel more comfortable buying from non-SF based competitors—although the SF-2200 may do a lot to change some minds once it starts shipping. The balance of price, performance and reliability is what keeps this market interesting. Do you potentially sacrifice reliability for performance? Or give up some performance for reliability? Or give up one for price? It's even tougher to decide when you take into account that all of the players involved have had major firmware bugs. Even though Intel appears to have the lowest return rate out of all of the drives it's not excluded from the reliability/compatibility debate. 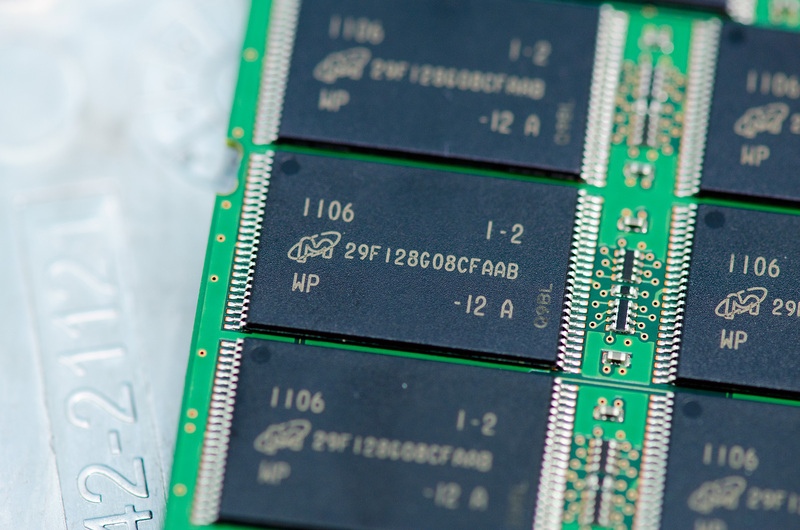 Micron and Intel have a joint venture, IMFT, that produces NAND Flash for both companies as well as their customers. Micron gets 51% of IMFT production for its own use and resale, while Intel gets the remaining 49%. Micron is mostly a chip and OEM brand, Crucial is its consumer memory/storage arm. Both divisions shipped an SSD called the C300 last year. It was the first 6Gbps SATA SSD we tested and while it posted some great numbers, the drive launched to a very bumpy start. A few firmware revisions later and the C300 was finally looking good from a reliability perspective. Although recently I have heard reports of performance issues with the latest 006 firmware, the drive has been working well for me thus far. It just goes to show you that company size alone isn't an indication of compatibility and reliability. This time around Crucial wanted to differentiate its product from what was sold to OEMs. Drives sold by Micron will be branded C400 while consumer drives are called the m4. The two are the same, just with different names. Under the hood, er, chassis we have virtually the same controller as the C300. 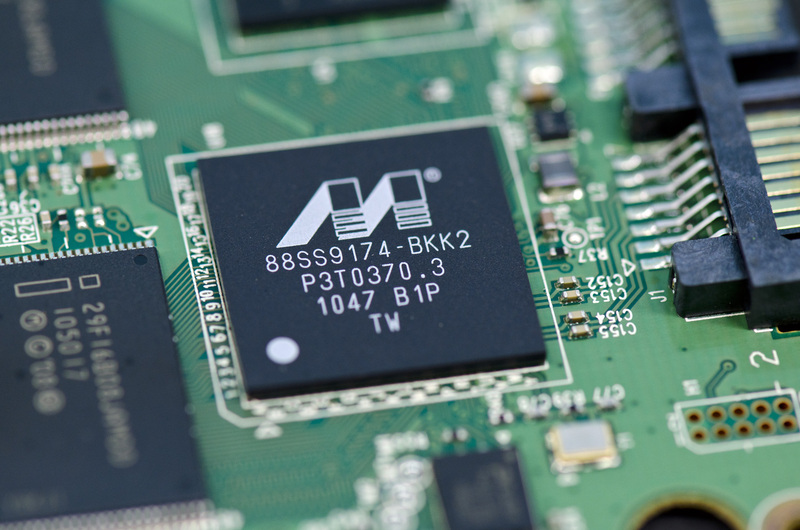 The m4 uses an updated revision of the Marvell 9174 (BLD2 vs. BKK2). Crucial wouldn't go into details as to what was changed, just to say that there were no major architectural differences and it's just an evolution of the same controller used in the C300. When we get to the performance you'll see that Crucial's explanation carries weight. Performance isn't dramatically different from the C300, instead it looks like Crucial played around a bit with firmware. I do wonder if the new revision of the controller is at all less problematic than what was used in the C300. Granted fixing any old problems isn't a guarantee that new ones won't crop up either. The m4 is still an 8-channel design. 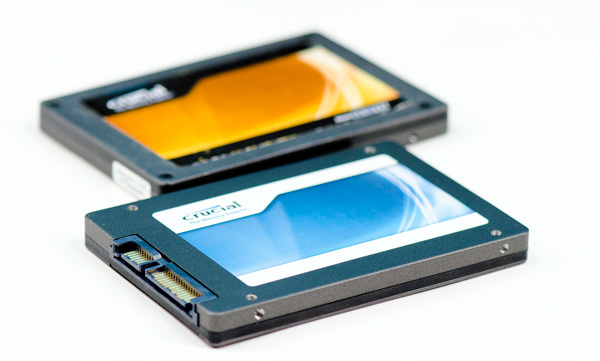 Crucial believes it's important to hit capacities in multiples of 8 (64, 128, 256, 512GB). Crucial also told me that the m4's peak performance isn't limited by the number of channels branching off of the controller so the decision was easy. I am curious to understand why Intel seems to be the only manufacturer that has settled on a 10-channel configuration for its controller while everyone else picked 8-channels. 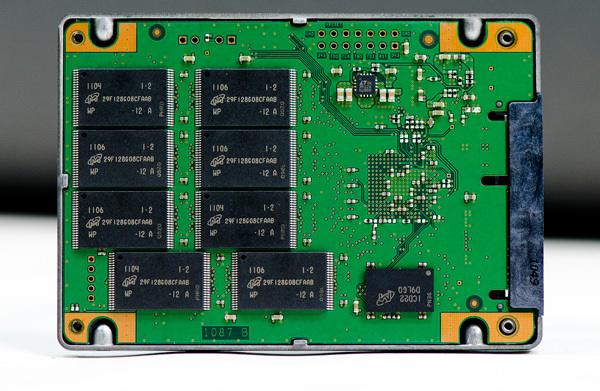 Crucial sent along a 256GB drive populated with sixteen 16GB 25nm Micron NAND devices. 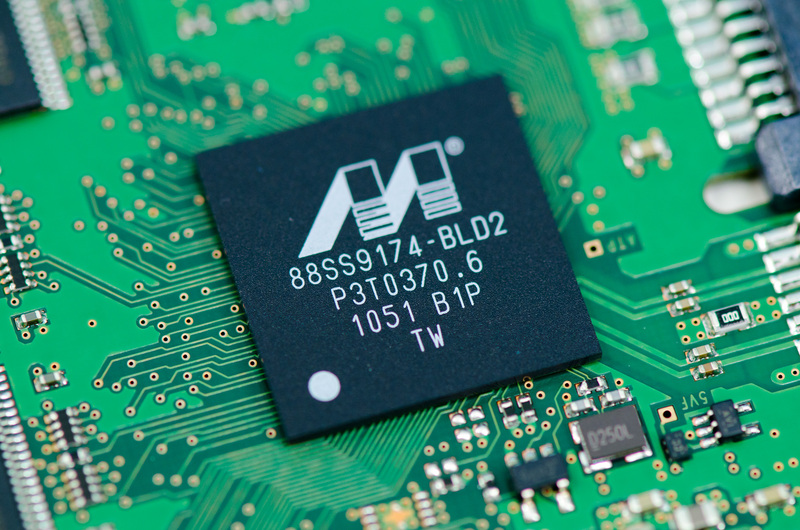 Micron rates its 25nm NAND at 3000 program/erase cycles. By comparison Intel's NAND, coming out of the same fab, is apparently rated at 5000 program/erase cycles. I asked Micron why there's a discrepancy and was told that the silicon's quality and reliability is fundamentally the same. It sounds like the only difference is in testing and validation methodology. In either case I've heard that most 25nm NAND can well exceed its rated program/erase cycles so it's a non-issue. Furthermore, as we've demonstrated in the past, given a normal desktop usage model even NAND rated for only 3000 program/erase cycles will last for a very long time given a controller with good wear leveling. Let's quickly do the math again. If you have a 100GB drive and you write 7GB per day you'll program every MLC NAND cell in the drive in just over 14 days—that's one cycle out of three thousand. Outside of SandForce controllers, most SSD controllers will have a write amplification factor greater than 1 in any workload. If we assume a constant write amplification of 20x (and perfect wear leveling) we're still talking about a useful NAND lifespan of almost 6 years. In practice, write amplification for desktop workloads is significantly lower than that. Remember that the JEDEC spec states that once you've used up all of your rated program/erase cycles, the NAND has to keep your data safe for a year. So even in the unlikely event that you burn through all 3000 p/e cycles and let's assume for a moment that you have some uncharacteristically bad NAND that doesn't last for even one cycle beyond its rating, you should have a full year's worth of data retention left on the drive. By 2013 I'd conservatively estimate NAND to be priced at ~$0.92 per GB and in another three years beyond that you can expect high speed storage to be even cheaper. In short, combined with good ECC and an intelligent controller I wouldn't expect NAND longevity to be a concern at 25nm. The m4 is currently scheduled for public availability on April 26 (coincidentally the same day I founded AnandTech fourteen years ago), pricing is still TBD. Back at CES Micron gave me a rough indication of pricing however I'm not sure if those prices are higher or lower than what the m4 will ship at. Owning part of a NAND fab obviously gives Micron pricing flexibility, however it also needs to maintain very high profit margins in order to keep said fab up and running (and investors happy). "And for those of you asking about my thoughts on the recent OCZ related stuff that has been making the rounds, expect to see all of that addressed in our review of the final Vertex 3." Too late Anand and you well know it. It has no place hidden in some unwritten review about next generation hardware either. I don't think people talking about that matter are that concerned with your thoughts on it, but about you speaking out on a product you reviewed that turned out to be very good and now is available in shops in the same box and shell but with different hardware inside and performance. Anyone might end up buying one of these things based on your good review of it and end up with quite another product when they return home. The 25nm fiasco happened while I was out of the country covering MWC. I was thousands of miles away from any testbeds. When it happened I immediately contacted OCZ's CEO and asked for his plan to make it right. To date I believe they have addressed all present concerns by allowing users to exchange drives with 64Gbit 25nm NAND for 32Gbit drives. It's my understanding that small capacity 64Gbit die drives have been discontinued. There are still some 64Gbit devices in the channel and I pushed for a name change on the impacted product but it looks like the best OCZ is willing to do is point you at the model number to (possibly) determine what you're getting. I finally got a pair of 25nm drives in this week - I wasn't going to make any public statements based on product I haven't tested personally. Unfortunately both drives, the 60GB 'E' and 120GB non-E use 32Gbit NAND devices. Regardless this is another check in the wrong column for OCZ and it will be addressed - not hidden - (as well as the SpecTek memory stuff) in an upcoming article. My original plan was to wrap that, the m4, Corsair P3 and Samsung 470 all into our Intel 320 review however being at CTIA last week left me with little time to get all of that done. I would've liked to have been on top of all of this from the start, and had OCZ not made things right publicly early on I would've stepped in (there was a lot of prodding from me behind the scenes during MWC week). The timing was unfortunate and I'm looking to bring on a regular storage editor to help ensure this sort of thing doesn't happen in the future. With all of the growth in SSDs as well as the increase in demand for HDD coverage, it's time to grow the storage team on AT. Anand, OCZ have only made things partially right, the issue is not solved. 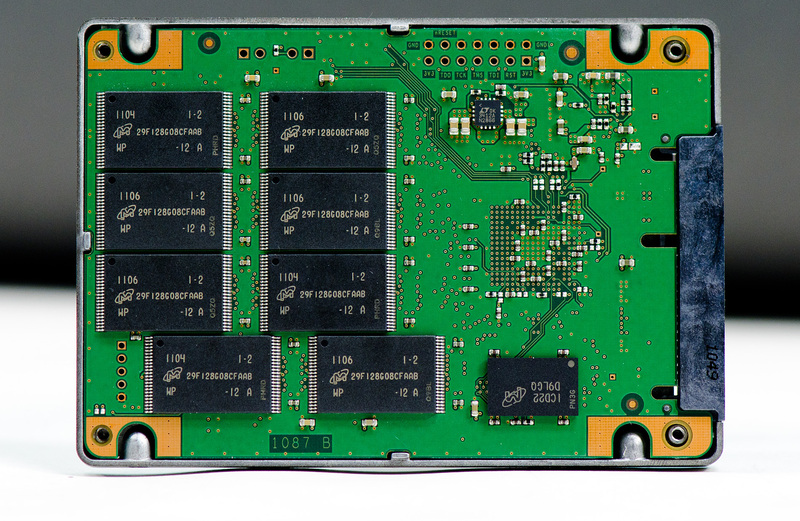 Ocz are swapping drives to meet IDEMA specs but performance is still slower. So they only made it 50% right. Its not the fact that its a slower drive, but they are using the same branding then making it impossible for users to know which nand is being used before the drive is purchased. The bigger issue is if it is ethical for a company to change specs and use the same branding. Afterall, Intel and Corsair saw fit to rebrand their 25nm drives. Other companies at least changed the model number. This is why I wanted to get drives in house. With 25nm 120GB and 60GB drives in hand now I can start looking at performance. In theory with the same number of die there shouldn't be any performance difference. If there is, something else is at play. It is absolutely unethical for a manufacturer to change performance and sell under the same product name. Let me do some testing and I'll touch on this very soon. the problem with you new test is which drives are you getting.. 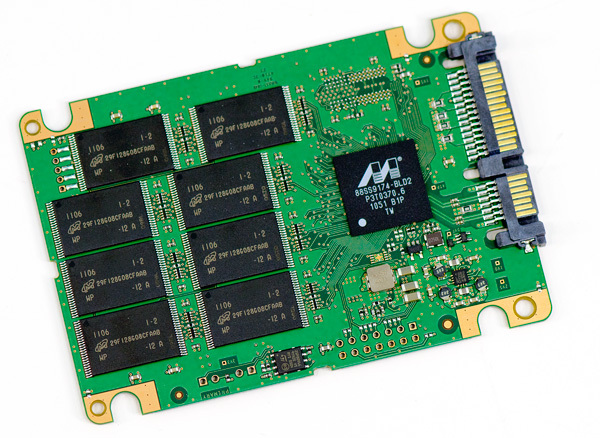 The first version of the 25nm SSDs that they tried to secrectly get through..
or the final version after all the complaints and the switch to the bigger nand chips..
the very first ones, they used only used 8 channels to connect those nand chips.. you need to get one of these drives as well..
after all the complaints, they finally admitted what they done, and said you could trade in for proper sized SSDs but you had to pay a different in price, even though you already paid for what you're finally being given..
after another run of bad press and complaints, they backed off the whole pay the different and just gave you a new SSD witht he right configs. it's still less space and less performance than the original Vertex2 that you originally bought.. and also has less of a life span. "However the company did respond quickly and I believe has made things right for those users who are impacted based on what I've seen here"
Actually, it looks like they only made things right for the people that noticed they were tricked a bit and complained. One might argue that there was no impact to those who didn't notice since hey, they got an OCZ Vertex 2 didn't they, but most of us wouldn't agree with that because they could put a Vertex 2 label on a box of dog crap if they wanted.